For breakfast, I often have two slices of heavy German-style rye bread, toasted, with peanut butter and sliced banana (man, I could eat that right now). Today, I had three. Okay, and I had one of yesterday's experimental waffles while I was waiting for the first lot to toast. Bad start? Well, I figured that I felt hungrier than usual, so I should just eat more. I took my two little boys to their gym classes and then we went upstairs for their snack. I planned not to eat anything, but I shnarfed the boiled egg yolk that The Big Small left and a couple of The Small Small's pistachio nuts. The other major difference today was that I hadn't planned ahead. There was no homemade soup in the fridge for lunch like there usually is. It was just me and The Small Small for dinner, so instead of cooking a good meal, we went for a long walk, stopped off at the park on the way home, and then ate super-quick cupboard food. There was plenty of cheese and chocolate in the house. I know my demons; I just can't always dodge them when they come at me! 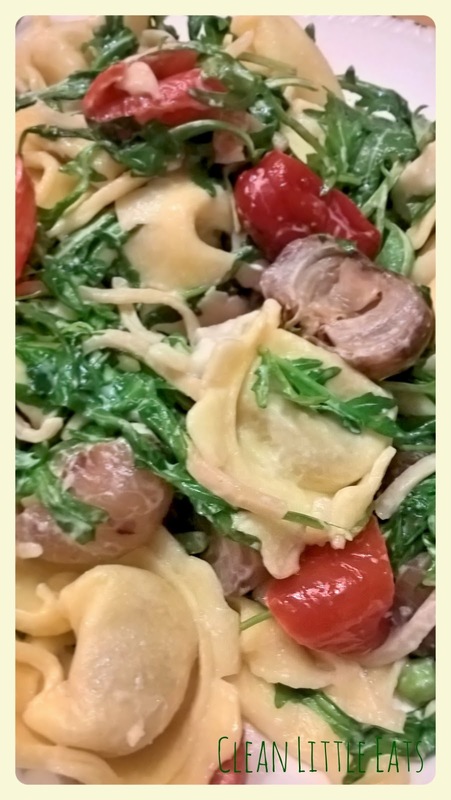 Emergency dinner: packet (white) filled pasta with cream cheese, spicy peppers, rocket, pickled onions and gorgonzola. It has been interesting to notice when my two little boys suddenly eat a ton more than usual. There are common phenomena with young children - like growth spurts, when the folds of fat at their wrists and ankles seem to stretch out overnight - which make it acceptable for them to have a day or even a week's binge. But it's not okay for adults, it is? Or should we just go with our desires for a short time, accept them without guilt and then start again with the next decision? If only it were that easy! Especially when I think about how hard I work at the gym! Sssssake.